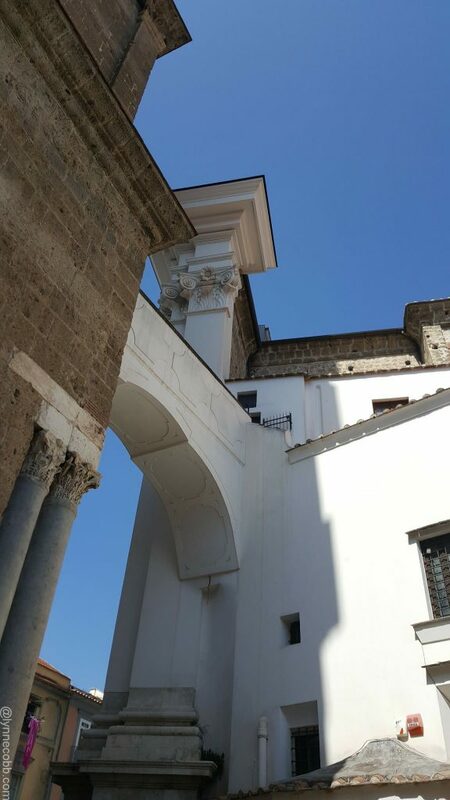 The exterior of the Aversa Cathedral. It was Lent when we visited Italy. Perusing through my travel journal on the anniversary of our trip, I realized I hadn’t written about the beautiful cathedral we toured. So, I am sharing these photos during Holy Week. Not only do they remind me of our travels, but seeing, breathing and touching some of the history of Christianity has helped me in my own spiritual journey. Winding through the streets of Aversa – which were not quite as crazy as Naples proper – was an experience. Shops and restaurants lined the streets, and laundry dried on the balconies a few floors above the street level – many times under the watchful eyes of older women. We drove down a bumpy cobblestone alley that took us behind a towering building. Parking the car, we heard beautiful church bells, getting louder as we approached the entrance. 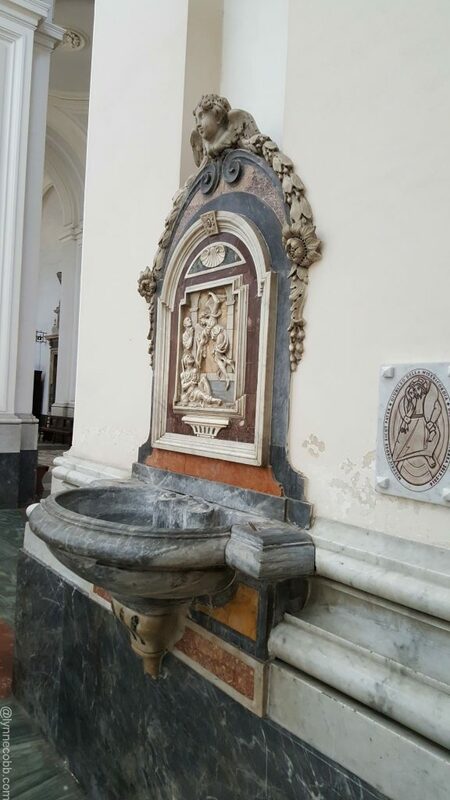 Holy Water font greets all those who enter. Being the holy season of Lent, we were excited for the opportunity to tour the Aversa Cathedral. Our friend, Mario, was our guide, explaining as best he could the history and beauty of this circa 12th century gem. Walking in to the Aversa Cathedral was breath-taking. Entering the cathedral literally took my breath away. The town of Aversa dates back to the 11th century. It is said that the Apostle Paul made his way through the Aversa area in 61 A.D., on his way to Rome. The cathedral was dedicated to St. Paul, and remains active to this day. 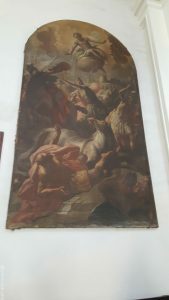 One of the many, centuries-old paintings and frescos. Centuries-old paintings and frescos adored walls and ceilings. 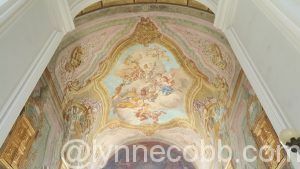 Beautiful frescos on the cathedral’s ceilings. 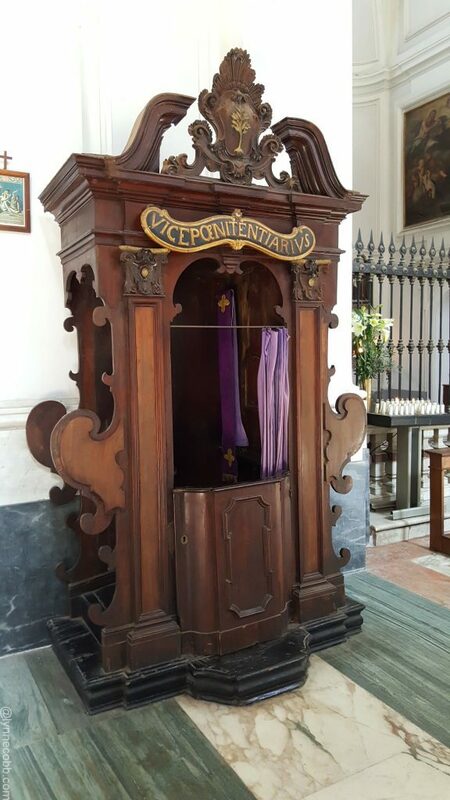 I immediately knew what the Confessional Booth was, and whispered to my husband that if I had to go to confession in that, I’d probably never sin in my life. It was interesting, but frightening, at the same time. I’d be afraid to sin if I had to confess it in here! Seeing the Holy Mother shrouded in black was emotional. I was reminded of her being at the foot of the cross during Christ’s crucifixion. 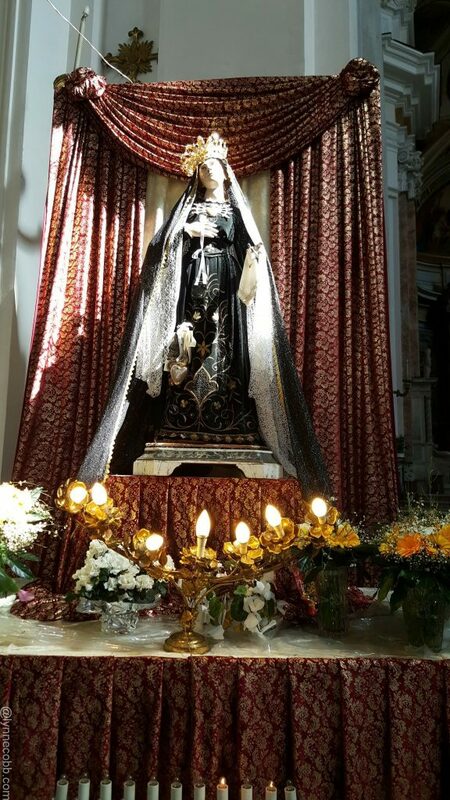 The Holy Mother, covered in black during Lent. The cathedral also was filled with presepios. 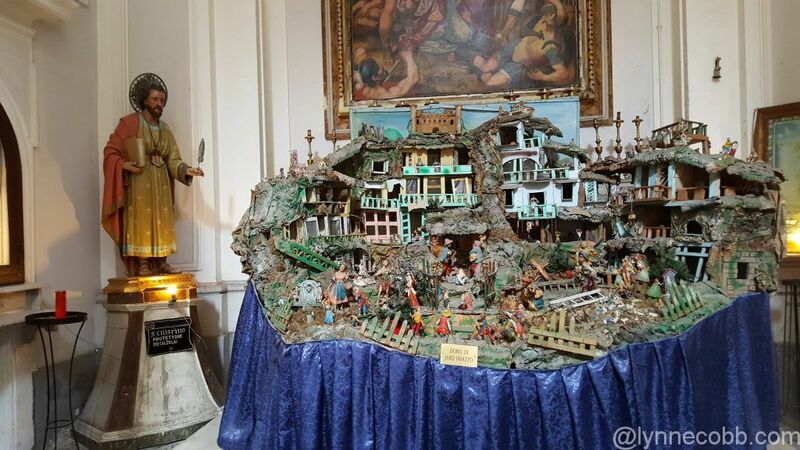 Homes, towns and churches have presepio displays around Christmas. We saw these throughout Naples and the Amalfi Coast. They are just beautiful, and items used are usually handmade. One of many presepios inside the Aversa Cathedral. 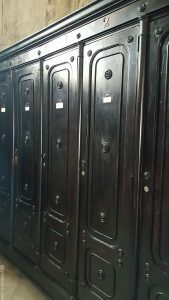 The priests’ lockers inside their waiting quarters/prayer room. Our friend, Mario, spoke to the caretaker, who then took us into an area where the priests get ready before Mass. This room was very large, and filled with lockers. It was attached to a prayer room where priests would wait until it was time to go into the sanctuary. 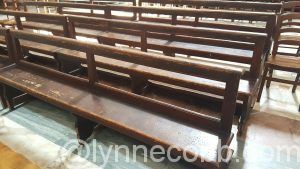 Pews that are at least a century old inside the Aversa Cathedral. It is my hope to one day celebrate Easter in Italy. I would love to see the gloom of the Passion replaced with the joy of the Resurrection. 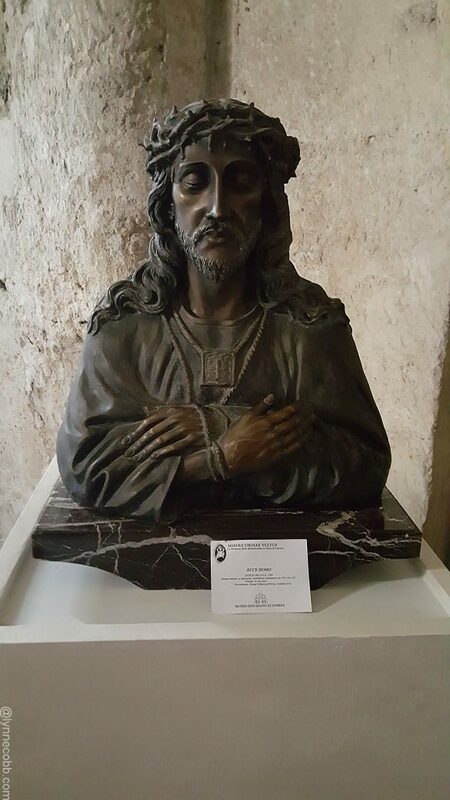 The Crucified Christ – a statue inside the cathedral. 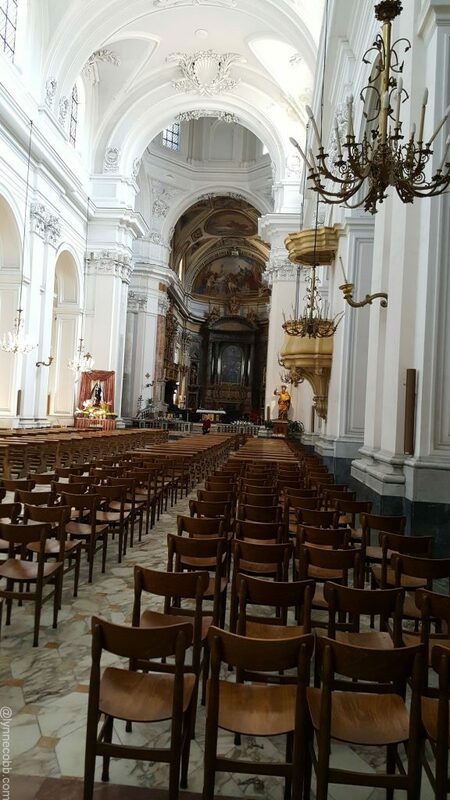 If you are planning a trip to Italy, I would highly recommend visiting a cathedral, especially if it is during a holy season. Not only will you see treasured artwork and architectural beauty, you will come away with a better understanding of the faith and culture of the country you are visiting. And, if you are like me, it may strengthen your faith, too. Very powerful for you to be there during Lent. We’ve been to Italy a couple of times — one of our favorite travel spots. I remember touring cathedrals and the Vatican and seeing the huge tapestries that visually and beautifully told the Christian story. You brought me back there with your pictures and description of the cobblestone streets and the surprises inside the buildings. I love how you connect it to your faith life. Thank you for sharing. Great posting and notations. Thank you for giving us a chance to see things in Italy that I know I will never get to see. Really appreciate your sharing memories of your trip. Thank you, Bob. Wishing you and your family a Happy Easter!